We invite businesses to support the Gitchi-Gami Trail Association with business memberships. Annual dues for business members are $250. Each business member will be recognized with listings on this page and on the home page “scroll,” featuring your company logo and links to your website and Facebook page. We will give you a GGTA decal to display to show your support for the trail. All business partners will also be listed as sponsors of the Annual Ride, featured in the GGTA newsletter, ride brochures, publicity, and the ride day banner. To join by mail, click on the MAIL-IN BUSINESS MEMBERSHIP link, print and complete the form, and mail with your check payable to the GGTA. To join online, click on the ONLINE BUSINESS MEMBERSHIP link. Online membership with a credit card is processed by secure PayPal payment. GITCHI-GAMI RIDERS, PLEASE THANK AND PATRONIZE OUR BUSINESS MEMBERS! 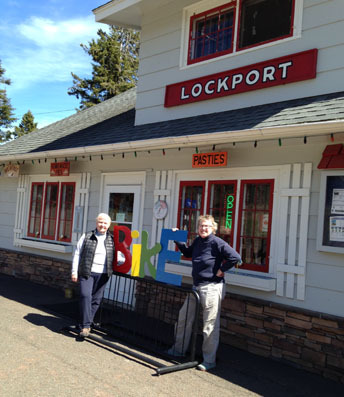 Owners Nan and Deb of Lockport Marketplace in Lutsen are GGTA supporters who welcome bikers. Metal artist Tom Christiansen designed the colorful BIKE rack for Lockport as a Cook County Great Place Project grant winner.